MULTIMAT® has demonstrated a high capability to reduce the bacterial load for a large spectrum of bacteria involved in the aetiology of " hospital infections" (HI). The results obtained in in-vitro studies suggests that MULTIMAT® is a very useful tool to reduce the load of pathogenic micro-organisms in all the locations where a decreased presence of bacteria and fungi is required to maintain the diffusion of “environmental borne” infections under control. MULTIMAT® can be placed down on floor or even under the open side door or on its specifically designed metallic frame (PAL®), allowing its movement during floor washing. Each mat has 30 removable layers for continual use. SeeDOS Codes : 30 layer Decontamination Mats for continual use. 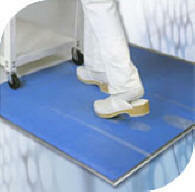 SeeDOS Codes : PAL : Metallic Frame for MULTIMAT allowing movement during floor washing. In recent years, the problem of the infections acquired within the hospitals, the so called “hospital infections” (HI) or “medical care related infection”, has arisen as one the most prominent issue in the field of infection control. Several different factors have influenced this increase: the appearance of multidrug resistant micro organisms and the extended use of invasive medical procedure for the diagnosis and treatment of patients are among the most important. In order to control the incidence of HI, which greatly contributes to the increase in costs of health management, many different strategies have been developed. First of all, many hospitals set up a commission composed by ID doctors, microbiologists, nurses and statisticians that must elaborate the incidence data for HI and draw new interventional approaches for their control on a short term (hopefully weekly) base. The warnings, coming from the microbiology data about any possible epidemic outbreak provoked by suspected micro organism, need to be handled by this commission in the shortest possible time, in order to break down the diffusion of the epidemic to a larger number of patients or wards. A limited set of well know micro organisms has been involved in the majority of the infection outbreaks in hospitals, even if the spectrum of the possibly so called “hospital pathogens” enlarges over time. The most commonly identified pathogens in this group include Methycillin Resistant Staphylococcus Aureus (MRSA) and Vancomycin Resistant Enteroccus Faecalis (VRE). The bacteria differ from the “not resistant strains” belonging to the same genus and species only from the presence and expression of selected genes that confer on these pathogens the capability to metabolize and survive in the presence of methycillin (a semi substituted derivative molecule of penicillin) and vancomycin (a glycopeptide antibacterial drug), respectively. These particular phenotypes are more aggressive from a pathogenic point of view and are frequently involved in epidemic outbreaks within hospitals causing a prolongation of the “hospital stay” time and a worsening of the clinical outcomes in the affected patients. Additional micro organisms that are commonly identified as a cause of HI include Aspergillus Fumigatus (that can generate a pulmonary infection thus worsening the prognosis of immuno deficient neutropenic patients) and Stenotrophomonas Maltophilia (that commonly originates from tap water within the Intensive Care Units (ICU) and can provoke severe lung infections, in particular in immuno compromised patients). A.fumigatus is generally sensitive to the majority of the antifungal drugs. On the other hand, this micro organism holds the capacity to grow within the host tissues without generating a clearly detectable clinical picture until a diffuse growth is present and this fact makes these infections deadly severe in immuno compromised patients, since once the fungus is detected by X-ray or by microbiological methods the patient is usually definitively compromised. Recently, clusters of hospital acquired pneumonia (HAP) caused by Corynebacterium striatum has been reported. This micro-organism generally has a narrow antibacterial susceptibility pattern. The appearance of this bacterium in the aetiology list for hospital infections raised a major concern among microbiologists and epidemiologists. Another microrganism that recently started to play a role in the field of HI, is Acinetobacter baumanni: this Gram negative bacterium has been identified with a rapidly increasing frequency in urinary tract and respiratory infections acquired during hospitalization, in particular in post surgical patients within the ICUs. MULTIMAT® has demonstrated a high capability to reduce the bacterial load for a large spectrum of bacteria involved in the aetiology of " hospital infections" (HI). The results obtained in in-vitro studies suggests that MULTIMAT® is a very useful tool to reduce the load of pathogenic micro organisms in all the locations where a decreased presence of bacteria and fungi is required to maintain the diffusion of “environmental borne” infections under control.